We use traditional techniques and small batch pasteurization to produce our cheese entirely by hand in a net-zero solar-powered building. 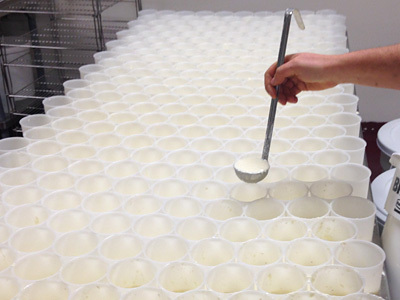 Cheesemaking is equal parts art and science. We source the best ingredients and work with them as gently as possible. 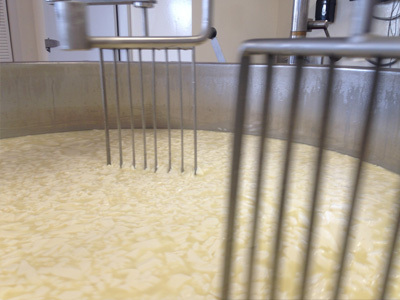 Yes, cheesemaking is hard work but we strive to let the milk, cream, culture, salt and mold shine through with their amazing flavors. 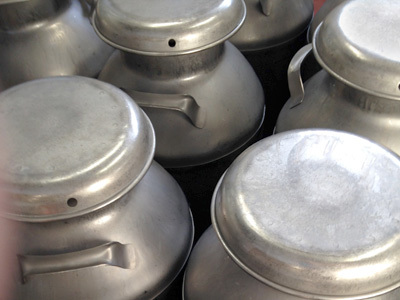 We’ve been hauling milk from the farm in 10 gallon milk cans since day one. 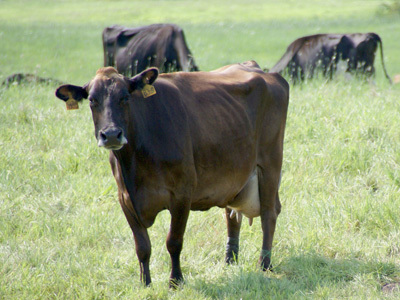 Cross-bred Jersey/Holstein cows produce high butterfat and solids organic milk for our cheese at Blissful Dairy in Bridport, VT. We haul milk in cans from the farm back to our creamery for immediate processing. 25 minutes from cow to cheese! 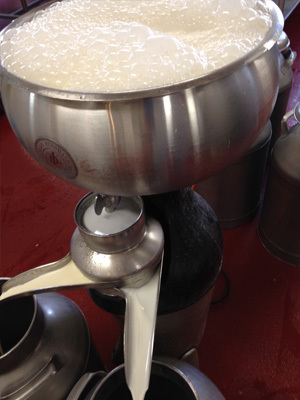 A circa 1950 DeLaval 618 cream separator turns a portion of the raw whole milk into cream and skim milk. 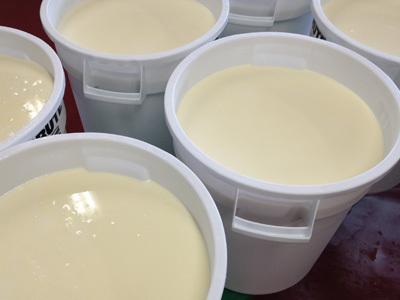 The cream is added back to the whole milk in the vat to produce our cream cheese and triple cream. 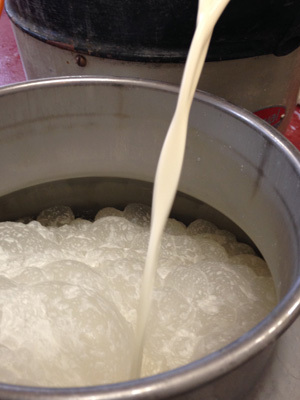 The skim portion is saved to be used in Queso Fresco and Anejo production the following day. 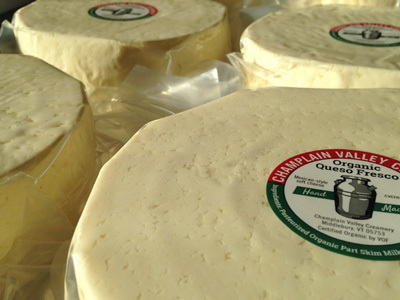 Most of our cheeses are fresh and short-aged, so they need be pasteurized by FDA rules. 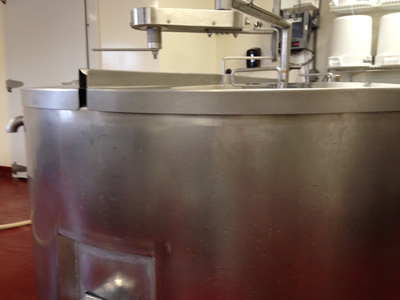 We use the old “low and slow” method of batch or vat pasteurization. The cream cheese and tripe cream are lactic curd cheeses which means they are coagulated, or “set,” by the action of the culture acidifying the milk. Queso Fresco and Anejo are set by the action of microbial (“vegetarian”) rennet, an enzyme that sets the cheese in 45 to 60 minutes. 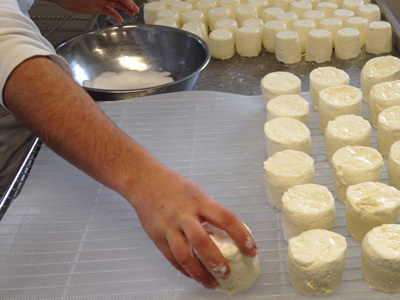 The triple cream is hand-ladled into forms after setting. 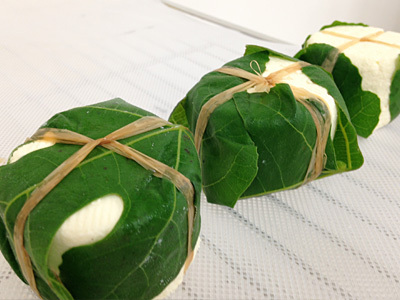 The cream cheese drains in cloth bags. Queso Fresco is cut in the vat and all the whey portions are all sent outside to a tank for pig feed! Cream cheese and drained overnight, salted and packed and ready for sale the next day. Triple creams are drained and salted over several days and aged in our “cave” for 7 to 10 days to develop the bloomy rind. 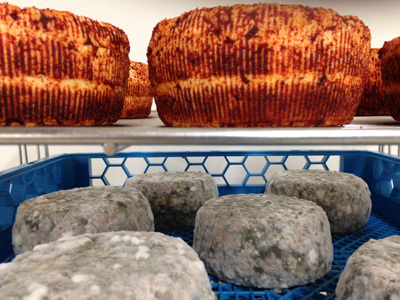 Pyramid Scheme gets a dusting of ash when dry and aged to develop the bloomy rind. 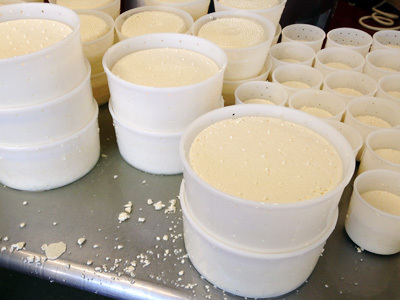 Queso Fresco curd is salted and “hooped” into small and large forms for draining. Queso Anejo is rubbed in paprika when dry and aged for 5 to 6 months. Cream cheese is hand-packed into 8-oz, 5 and 10-lb tubs. Triple creams are hand-wrapped in breathable paper after full rind development. 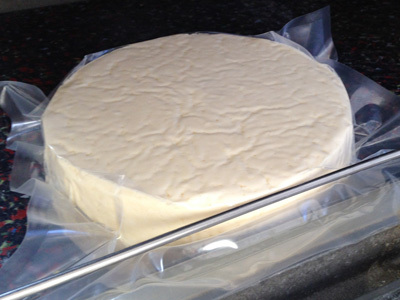 Queso fresco is packed in vacuum sealed bags the day after it is made. After aging and rind-brushing, whole wheels of Queso anejo are vacuum-sealed for sale.